The Nightmare Before Christmas was this year’s field show. Use the links below to watch our performances. Mr. Jeremy “Jack Skellington” Hammond looking his best! JFK COMMUNITY SERVICE EVENT IS THIS SATURDAY! are needed and you can SignUp here. fax machines, and small household appliances. suggested donation is $3 per grocery bag and $5 per banker’s box. school parking lot on the following dates and times. items, collect money or just help shoppers. contact Maria Rodriguez by email or at (916) 402-6629.
parking lot at the corner of Florin Road and Gloria Drive. with delicious street tacos and other Mexican treats. in the Band Hallway. Thanks again for your help! If your food routine needs a change up, then you’re in luck! Join us for our Annual Breakfast for Dinner Fundraiser. and a long table of desserts up for silent auction as well. Need tickets? We’ve made purchasing tickets easy. for tickets, or purchase tickets online. Advance tickets are $10, $12 at the door. Children ages 5-12 are $7; under 5 eats free. Any additional donations are gladly welcomed! the award winning JFK Music Department. Each family’s help is needed for a successful event. needed or where you can volunteer in person to help. Fees by working as few as five or six volunteer shifts at these events. you can earn enough credits in one event. How easy and fun is that? travel costs when the band goes on its big trips. of print order proceeds will benefit the Band and Color Guard. Band parent Karen Landeck for making the arrangements. positions can be shared among several parents. collaborate with Webmaster to post photos to Gallery. Tuesday of the month from 8:00-9:00 pm in the Choir Room. comprehensive and award-winning music program in the city. 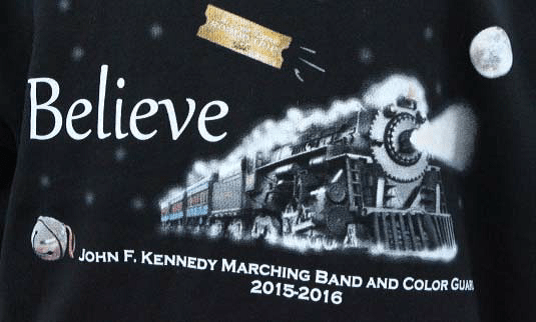 Help the JFK Marching Band purchase new band uniforms. a donation by visiting our GoFundMe Account. You can also copy and paste the following link in your search field. advance for supporting the Band with your generous donations. your purchase will be donated to the Marching Band & Color Guard. for quick access to all your Amazon shopping! Choir: Mary Did You Know? smoke from the Northern California wildfires. Fair Share Fees for the 2018-19 school year are $425. the locked mailbox in Mr. Hammond’s office. 14 – SCHOOL’S. OUT. FOR. SUMMER! YAY!!! and Band Camp (August) are just around the corner! WHO SAYS FUNDRAISING CAN’T BE FUN? Earn money to offset your Fair Share of trip fees. It’s easy! put a huge dent into paying your Fair Share Fee or trip costs. or check out our fun Fundraising page. You’ll be glad you did! Contact Karen Albert for answers to your questions. MARCHING BAND & COLOR GUARD DVDs ON SALE NOW! Cindy and indicate your preference for Standard or Blu-Ray. Spread the word! Tell your friends! Help us reach 1,000 Likes!